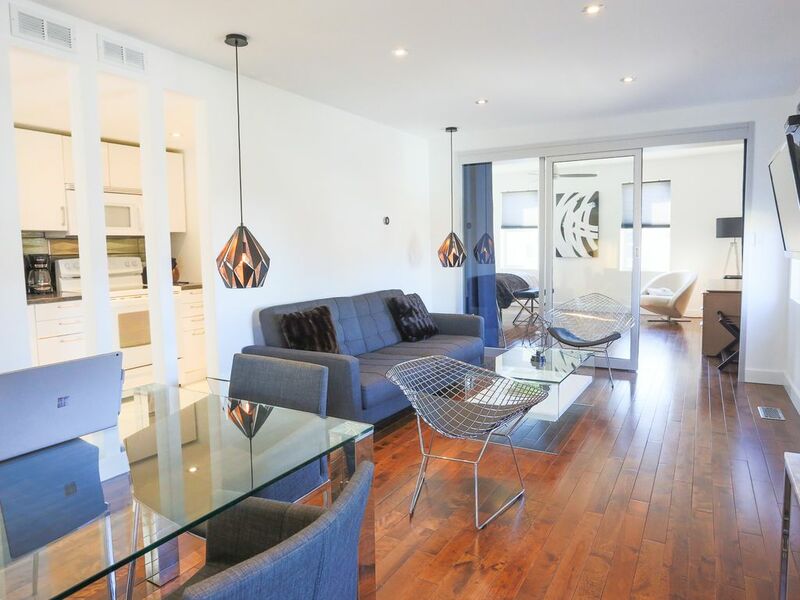 A new architecturally renovated 2-bedroom apartment with a king-size bed, a double bed, a futon couch and queen-size air bed (optional), is located steps to Landsdowne Park (TD Place) and the Rideau Canal. This modern property combines urban conveniences with peaceful nature. With views of the Rideau River, this property is within walking distance to many shops, recreation facilities and restaurants. Inside you'll find a beautifully kept living space set with a full kitchen and enough space for 5 ppl. Family friendly with 'Brewer Park and Pool' a short walk away - you will love it! This is a comfortable, small and surprisingly quiet apartment in a nice part of Toronto. Everything was sleek and modern, and the kitchen was well stocked. The hosts made us feel very welcome. I would recommend this apartment to a couple + 1 visiting the city. Very nice, updated, modern apartment, with lots of electronic geegaws (good wifi, music, temp control etc. ), full kitchen, freshly painted, new furniture, etc, in a great location at Bank and Sunnyside, close to Parks, Canal, Rideau River, Glebe, and tons of great restaurants, cafes, charming shops lining Bank Street. A few minor glitches (front door/keys didn't work at first, dishwasher hadn't been emptied) prevent it from getting 5 stars for now, but John is a very friendly and accommodating host, dealt with everything quickly and efficiently, and will likely be a Five Star-er by the time you read this! Steep stairway to living area for those (like us!) of a certain age. All in all a great place - highly recommended!